If you've been following me awhile or even if you just check in occasionally, you've probably noticed that I l.o.v.e. high-waisted shorts and skirts! I personally think that high-waisted a-line skirts, maxi skirts and even skater skirts are some of the most flattering pieces out there! I purchased this pair of printed, high-waisted shorts a few years ago, but they've proven to be more versatile than I ever would have imagined. They make for a great summer-to-fall transitional going out look like here (hemlines for hot temps in fall colors), or can even be styled for winter over tights like I did in this post. Me encanta el estampado de tus shorts!!! Estás estupenda, Jacy!!! 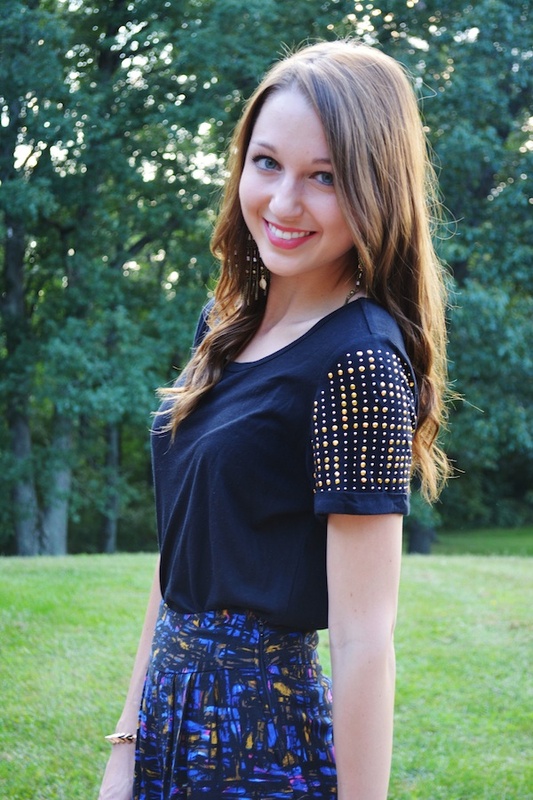 These shorts are so cute, love this outfit and the little studs on the sleeves. The shorts are adorable. The print is great and your styling is superb with the chic clutch and heels. These shorts are amazing! You look beautiful! These shorts are super cute on you and definitely flattering. Love it! Look at those legs! I love high waited items because they make legs look so long! Looking gorgeous! Your shorts are so cute, love the print. And the sleeve details on your top is so cute. My favorite pair of shorts & jeans are high waisted-- but you definitely need to know how to wear them to pull them off! Love that envelope clutch! Love both ways you've styled the shorts. I love a good transitional piece...one less thing to pack away in seasonal storage! Perfect outfit for your new shoes! I haven't personally tried high waisted shorts, but they look great on you! This whole outfit is so stylish and I love that it's a little bit edgy too. I like this whole look! I can't even pick out an item that I like the best, but the way that they all fit together and complement each other is incredible. Great job!